With many ASX investors currently focused on lithium and gold stocks, one ASX listed micro-cap has begun drilling at two high potential projects containing those very same commodities in Finland, with imminent results expected. The two projects are within 4km of each other allowing for major cost efficiencies. Historically, shallow drilling returned high grades from both areas, but this company is taking the next steps by drilling deeper to see just how far these high grade resources might extend. This company’s advanced lithium pegmatite project has already delivered above average grades of 18m at 1.8% Li 2 O, including 9m at 2.6% Li 2 O. Meanwhile, the gold project returned eye catching results of 25m @ 3.17g/t including narrower intersections of 3m @ 9.3g/t and 4m @ 10.3g/t. Whilst previous drilling was carried out by the Finnish government in the 1980s, and in the period 2001-2005, the more recent diamond drilling at the lithium project has been completed with the samples sent for assessment. The results from this company’s first drill hole returned with excellent grades, including 24.2m at 1.44% Li 2 O. Further results from the other lithium drill holes are expected to drop in the coming weeks. Of course, drilling success for speculative mining stocks is no guarantee. Any consideration of this stock for your portfolio should be done with a healthy degree of caution as well as seeking professional financial advice. Early results are due any day now. It is all go for this company’s neighbouring lithium and gold projects in Finland, and it is worth noting that this is a region renowned for its mining know-how and skilled workforce. Scandinavia is home to world class infrastructure, where exploration, development and mining can take place all year round without weather restrictions. This company also has one more project up its sleeve: an advanced copper project that will come into play in the near future in Sweden. The project has an estimated mineral resource of 52.4Mt @ 1.2% copper, with a mining inventory of 18Mt @ 1.2% copper that would support a mine life of 9 years at 2Mt per annum. The copper project is planned for production by 2020. With projects spread across three different commodities (lithium, gold, copper), this company is well diversified to take advantage of current favourable market conditions in lithium and gold, whilst getting on the front foot with its copper play to be ready if and when copper swings back into favour. 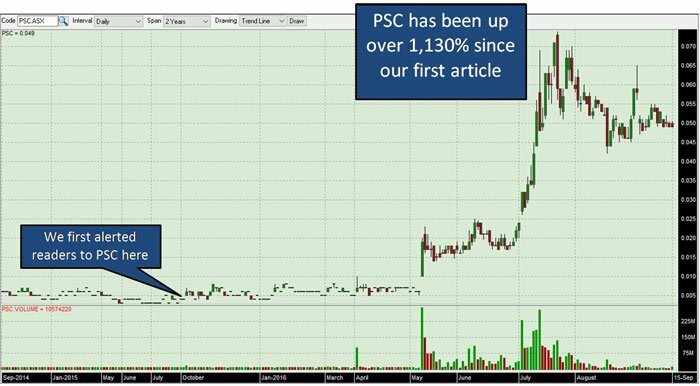 Currently capped at just $20M and with $2M in the bank, the company is well placed for a significant re-rate increase over the coming days and weeks should the drill results continue to be positive. 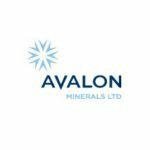 Avalon Minerals Limited (ASX:AVI) has a stream of news flow set to come out in the coming weeks with regards to drilling on its Kietyonmaki lithium and Satulinmaki gold projects in Finland. The two projects are spaced just 4 km apart with the same drill rig moving between the two sites, bringing up 3000m of core to be analysed. Diamond core drilling is being conducted at both sites in order to give geologists the best possible understanding of the mineral structure underground. AVI also holds a commercial sized copper deposit in Sweden and additional early stage lithium holdings in Finland and Sweden. 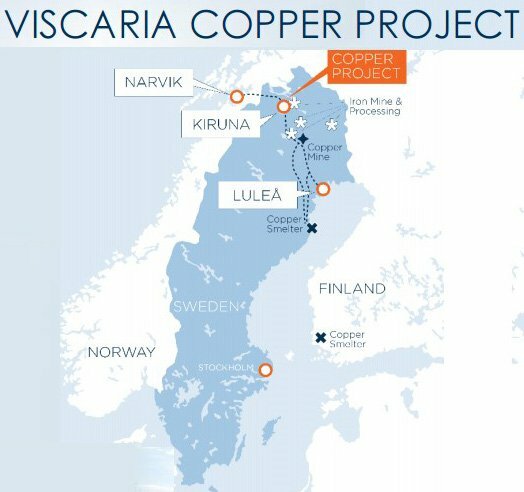 Viscaria copper project, in northern Sweden. AVI’s projects have all already had low-level low-cost assessment and exploration work performed on them to filter out the chaff, versus potential commercial deposits worth drilling – in other words the wheat. With all the projects being located in Scandinavia, country risk is low. Scandinavia has world-class infrastructure including roads, rail, power networks, most of which is renewable power (for example Finland generates 75% of its energy from hydro, and 25% from nuclear), and a mining heritage which brings with it an abundance of high quality mining consulting groups and contractors. AVI’s projects are located just 100km north west of Helsinki, Finland. Turkku, located 75km to the south west, is Finland’s second largest port and the Project sites are easily accessible by nearby road and railway infrastructure. The area also includes high capacity powerlines powered by cheap, predominantly hydro energy, reducing the overall cost of the projects. It is this infrastructure that borders today’s company’s projects. With a leadership team well versed in determining what is hot and what is not in exploration and mining projects, AVI knows what to look for when assessing a project that might provide shareholders with strong returns. The good news for AVI is that backing up the strength of its Projects and management team are the current prices of gold and lithium as well as the demand for these sought after resources. So let’s take a quick look at how demand is building in the lithium space. In Nevada, Tesla and now Volkswagen are moving their operations into the lithium producing region in order to be close to the mineral source needed to produce their lithium ion batteries. Regular Next Small Cap readers would have heard all about the Nevadan lithium scene in our articles on Caeneus Minerals (ASX:CAD). Samsung is building its own lithium dependent ‘Gigafactory’ over in Hungary, which is within supply distance of AVI’s lithium projects. 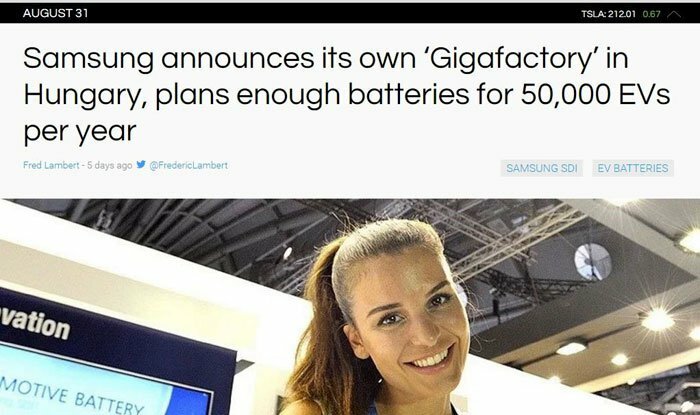 The large battery producing factory hasn’t confirmed exact planned output but states that it will have an annual capacity of batteries for 50,000 pure electric vehicles. If all goes to plan, AVI could be well positioned to play in the European lithium space. Whilst both the Samsung plant and AVI’s mining operation are future goals, the move by the South Korean multinational highlights the move into lithium dependent technologies by these multinationals and also the move into Europe to produce lithium-ion batteries. The demand for lithium is more than just one company can supply, and there is every indication that the surge in quality lithium stocks with high grade, commercial resources has plenty left to run. Can AVI repeat a similar feat to other high performing lithium explorers? Of course, this is no guarantee to eventuate for AVI. Do your own research and take a cautious investment approach when considering stocks for your portfolio. Drilling at AVI’s high grade Kietyonmaki lithium deposit commenced mid-August, with an estimated 16 drill holes to be completed. 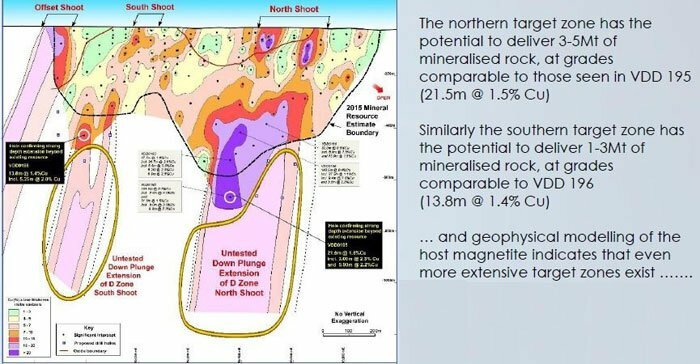 The program will cover an initial strike extent of 300m and depth of 250m covering a 200m wide zone where there are hard rock, spodumene bearing lithium pegmatites, similar to that found in the Pilbara region in Australia. Avid lithium investors would be aware of the discovery made by the $660M capped Pilbara Minerals (ASX:PLS) in that part of Western Australia. Results from this first diamond drill hole have just been released and the grade results are outstanding, including 24.2m at 1.44% Li 2 O. News will begin to flow over the coming weeks as core samples from additional holes are tested and returned. 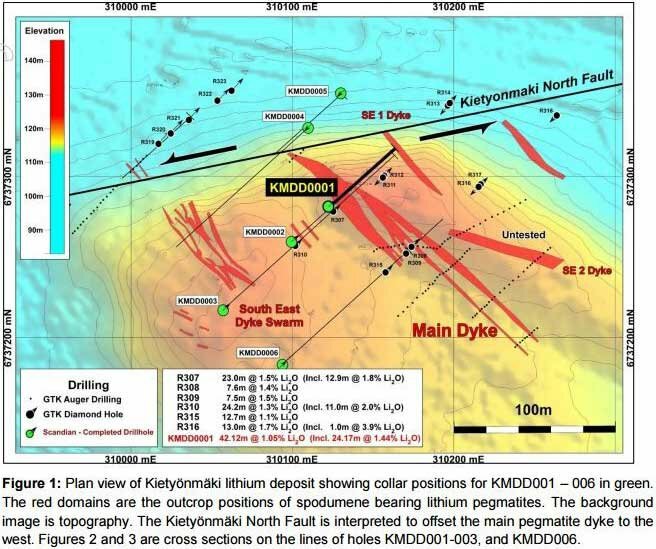 If further drill hole results continue to be as positive as the results from KMD001, then we could see the Kietyonmaki project fast-tracked towards production... either way investors won’t have too long to wait for a result. In 1985, the site was drilled by the Geological Survey of Finland, discovering a lithium occurrence. The diamond drilling conducted returned results of 18m at 1.8% Li 2 O, including 9m at 2.6% Li 2 O. In addition to the drilling results, other data included detailed ground magnetics and geological mapping and rock chip sampling, all of which has been analysed by AVI to identify the current drill target holes. The aim of AVI’s current drilling program is to confirm the historical results and the geometry and size of the deposit. However, where those historical drill holes were rather shallow, AVI is going far deeper, in order to see how far a resource might extend. We will see in the coming weeks what the other drill holes return for AVI, but as we saw above, so far the first assay results returned have been positive. 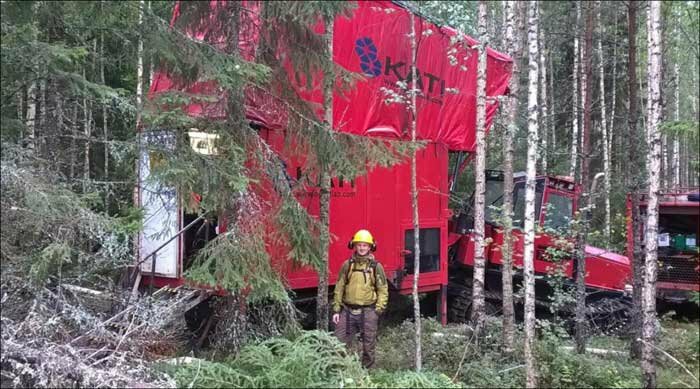 AVI’s drilling rig has just made its way 4km down the road from the Kietyonmaki lithium project to the Satulinmaki high grade gold project. The ground has been pierced in what will be one of several planned drill holes. The initial drilling campaign will total around 930m and test zones below historical drill holes including previous intersections. 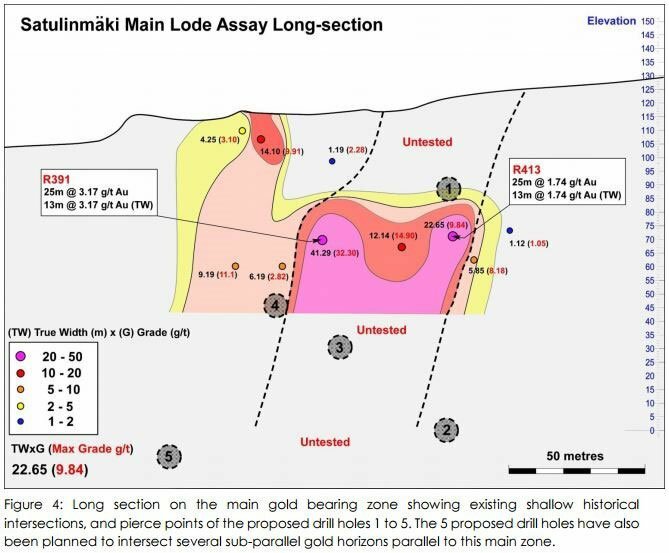 First assay results from AVI’s gold drilling program are expected to be available in the coming days. Diamond drilling by the Geological Survey of Finland during 2001-2005 returned exceptional grades including 25m @ 3.17g/t including narrower intersections of 3m @ 9.3g/t and 4m @ 10.3g/t. 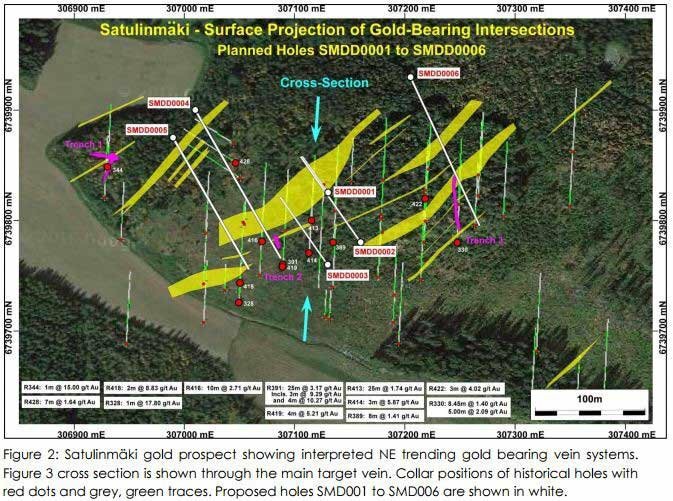 During the government led drilling campaign, 60 shallow holes were completed at Satulinmaki for a total of 4,727m drilled, which only tested the plane of mineralisation to a depth of 70m below the surface. There were also an additional 40 shallow holes drilled at Riukka for a total of 3,350m and tested to a vertical depth of 60m. Satulinmaki has been selected by AVI as the priority target due to its intense and complex quartz veining and alteration. The aim of the drilling will be to assess the geology and grade of the deposit. As we mentioned above, previous drilling by government only tested to a depth of about 70m, whereas AVI will be drilling deeper below the surface down to 150m. The geology in the region suggests that there may be further targets underground with a nearby gold mine having development at 1km depth. With gold sitting around all-time highs, the project offers significant upside potential for AVI – in addition to the lithium project. Expect continuous news flow from the Satulinmaki gold project over the coming weeks, in addition to ongoing news from Kietyonmaki lithium. 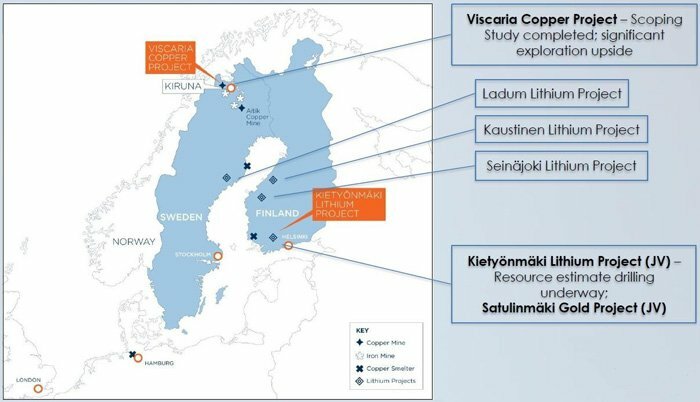 Whilst the lithium and gold projects in Finland offer the best short term potential return for investors with an eye for near term drill results, the Viscaria copper project in Sweden complements that with some long term value to AVI. If copper swings back into favour, this copper project would come certainly come back into play when considering the stock’s value. 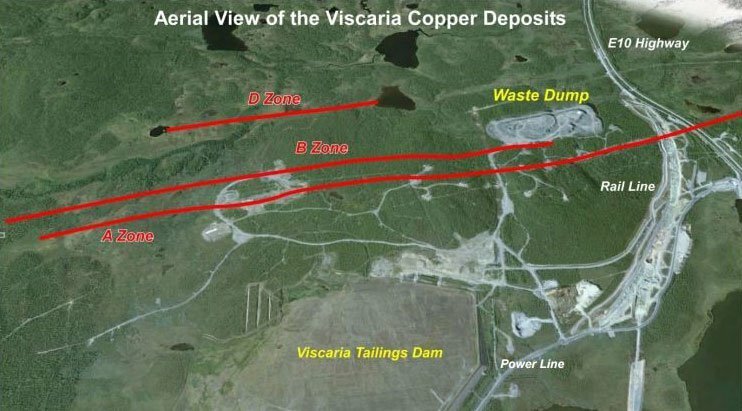 AVI’s Viscaria project has a mineral resource estimate of 52.4Mt @ 1.2% copper, with a mining inventory of 18Mt @ 1.2% Copper, supporting a mine life of 9 years at 2Mt per annum. Located in the North of Sweden, the site underwent 8000m in 2015 returning excellent results. The further down the drill bit went, the better the ore grades came back. Nearby hydro power could be used at the site for a low cost, with a nearby major iron mine the reason for excellent infrastructure and accessibility already in place in the region, including electric powered rail. The Viscaria project is close to the mining town of Kiruna, offering simple access to the skilled workforce. A scoping study released in December and was updated in April of this year that assumes a copper price of US$3 per pound. The proposed drilling and mining studies aspects of the project are presently on hold while a suitable funding package is put together, however an environment and social impact study is ongoing which a key step in the path towards final permitting for a mining development. The project is covered by approved exploitation concessions. With a decent sized resource estimated in the ground, the project offers long term appeal for investors with an eye for counter cyclical investments, whilst the lithium and gold projects offering more potential for immediate return. However commodity prices are notorious for their fluctuations, and small speculative mining stocks don’t always go up – it’s always a good idea to also consider your own personal circumstances and risk profile before investing. Additional lithium projects are held by AVI in Finland and Sweden that are still in their infancy, so we won’t go into too much detail here. AVI has lodged and registered an exploration reservation application covering approximately 200km2 in the Kaustinen district, which hosts some significant lithium deposits. The sites will have low-level low-cost assessment and exploration work performed on them to find which ones are worth pursuing. The tenements held offer the potential for AVI to become a serious lithium player in the untapped European market. News from both AVI’s lithium and gold projects will begin flowing to market over the coming weeks and months. 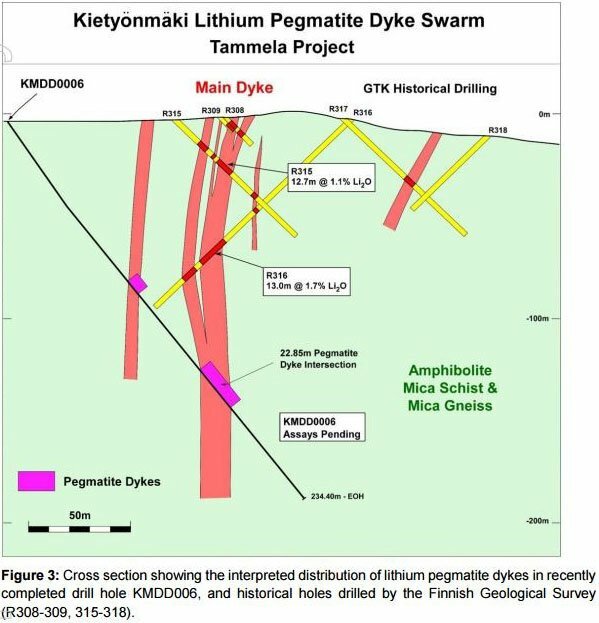 Initial results from the first diamond drill hole at Kietyonmaki lithium project included an exceptional 24.2m at 1.44% Lithium and 9m at 2.00% Lithium. Consistent news flow from both Kietyonmaki and Satulinmaki will continue throughout September and October as core samples are sent to be tested and results returned to be announced to market. 3,000m of drilling has been contracted across the Kietyonmaki and Satulinmaki projects – giving plenty of insight over the coming weeks into just how big these projects may become for AVI. With Samsung planning to launch its 50,000 EV battery per year ‘Gigafactory’ in Hungary in the second half of 2018, AVI is geographically located in an optimal position to become a supplier of choice to meet the demand for lithium. The added Viscaria copper project forms the basis for long term returns for AVI, whilst being spread across multiple commodities de-risks AVI’s exposure by not being reliant on one particular resource.